Go into the house to the left of the Pokemon Center. An old lady will give you a Soothe Bell. In the next house over, show the lady inside a Pokemon of yours to receive a Footprint Ribbon. If you have a Flying or Psychic-type Pokemon on your team, you can help the other guy in the room for some Stardusts. In Shalour City, you'll find Mr. Bonding in the Pokemon Center. Talk to him and he'll give you Critical Power Lv. 1. Talk to the scientist in the house next to the Pokemon Center to get an Eviolite if you have seen enough Pokemon. As you head north, Trevor and Tierno will come by to chat it up. 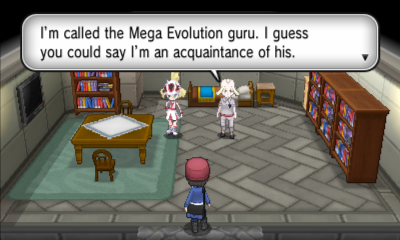 They remind you you're supposed to go see the Mega Evolution guru, who they say is at the Tower of Mastery. As you head north, Tierno catches up to you to give you the Intriguing Stone. Continue ahead to enter the Tower of Mastery (do pick up the Max Ether right outside the walls). After walking inside the Tower and into the room underneath the giant Lucario statue, the Mega Evolution guru greets you. 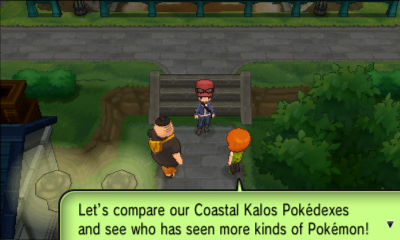 Korrina, the Shalour Gym Leader, is also with him. Everyone will go outside; it turns out all five of the kids are here. Interestingly, it turns out Korrina is the Mega Evolution guru's granddaughter. 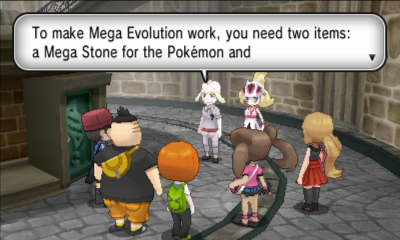 The Mega Evolution guru goes on to explain Mega Evolutions are temporary transformations of certain evolutionary lines. He explains both the trainer needs a Mega Ring. He'd like to pass it on to you but only has one of them. So, naturally, you and Serena will battle it out to see who gets it. 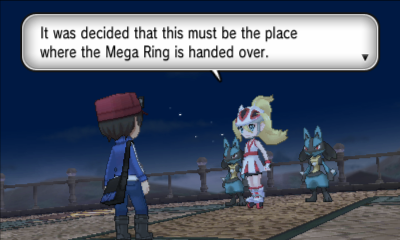 After winning the battle, Korrina tells you to defeat her and earn her badge first before giving you the Mega Ring. So, head over to the gym and show her you're ready for it! 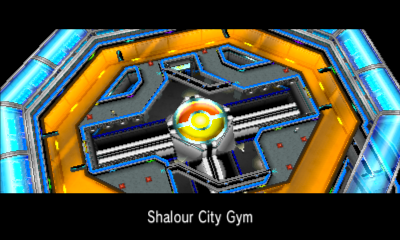 As you'd expect, the Shalour City Gym specializes in Fighting-type Pokemon, so Flying-type Pokemon will do great here. The gym is a roller skating rink. You'll have to skate around to catch up to the skating trainers for battles. After battling all four skating trainers, you'll be able to battle Korrina. Skate on the rail to get to the center of the middle, where you'll find Korrina. Leader Korrina uses a Lv. 29 Mienfoo, Lv. 28 Machoke, and Lv. 32 Hawlucha. For defeating her, you'll receive the Rumble Badge, which allows you to trade Pokemon up to Lv. 50, as well as use Surf outside battle. Additionally, she'll give you TM98 Power-Up Punch. She then tells you she wants to have a Mega Evolution battle atop the Tower of Mastery. 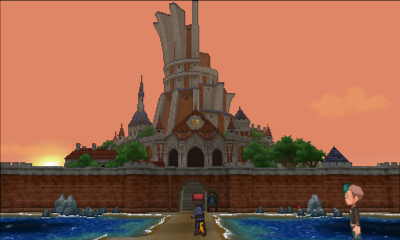 Head back to the Tower of Mastery to battle Korrina once more. Go to the back of the Tower and head up the ramp. In the third room on the way up, the guy inside gives you TM47 Low Sweep. 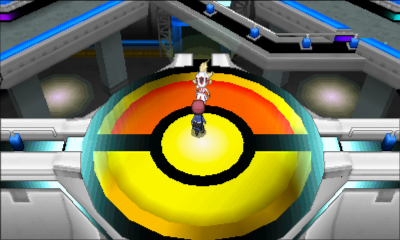 When you get to the top, Korrina will give you the Mega Ring. One of her Lucario sides with you, so you'll be having a Lucario on Lucario battle! In battle, choose the Mega Evolve option to Mega Evolve Lucario into Mega Lucario and you'll witness your first Mega Evolution. After the battle, Korrina asks you to take Lucario with you. Head back to the city and head east from there. Serena will stop you and give you HM03 Surf. 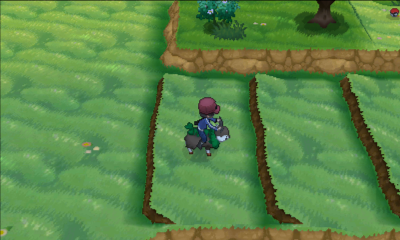 Go onward to Route 12. 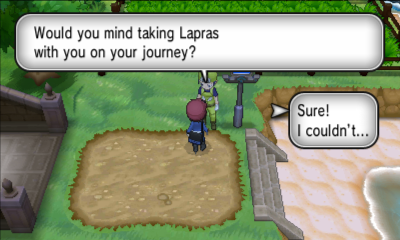 First thing on Route 12 is a guy who asks to give you his Lapras. Take it! You can find a hidden Honey in the corner of the patch of grass nearby. Head south, cut the tree, and pick up the Aspear Berry. Go back to where you were and surf across to the other side. At the southern tip of the beach, you can find a hidden Net Ball on a rock. Once on land, head north to get to Baa de Mer Ranch. Go into the house to get TM45 Attract from the little kid. Go behind the house, cut the tree, and pick up a Sachet. Go out into the field and hop on a Skidoo. While riding Skidoo, you can actually hop over the steep side of ledges. Go east on Skidoo. Hop off to go up the steps to pick up a Shiny Stone. Go southwest, cut the tree, and pick up the Leftovers. Continue southeast. From the beach, surf all the way west, and pick up the hidden Water Stone on the rock. Back on land, head east into Coumarine City.